Faced with a distracted US and an increasingly assertive China, Australia needs, more than ever, friends and partners in the region. Originally published in the Straits Times. While concerns about US leadership under President Donald Trump dominated the headlines over the past year, 2017 will be remembered as the year that foreign policy came home to roost in Australia, amid mounting concerns about Chinese interference and influence operations. There is, to be sure, more to Australia's foreign and security policy than steering a course between the region's behemoths. But the US-China dynamic increasingly insinuates itself in Australia's surrounding region, and overshadows much of what Canberra does and thinks about. Australia's foreign policy and security environment is coming under combined challenge from an emboldened, more powerful China, as well as new uncertainties about the commitment and leadership of the United States in Asia. Hints of this were evident in Prime Minister Malcolm Turnbull's speech at the Shangri-La Dialogue in Singapore last June. It dominates the subtext of the Australia's foreign policy White Paper unveiled late last year, the first in over a decade. And 2018 promises to be a testing year for Australia's foreign policy, as it tries to navigate a course between the US and China. The likelihood of a more adversarial Sino-US relationship on the horizon brings heightened risk, as well as an imperative for Australia to be more active on the region's diplomatic stage. Just weeks into the new year, tensions with China have flared anew over accusations by an Australian senator that Beijing was seeking to boost its influence in the Pacific by constructing "white elephants". This prompted a swift rebuke from China's Foreign Ministry. While the senator's reported comments were not reflective of a settled official position, China's economic in-roads into the South Pacific have unnerved Canberra, as growing Chinese aid threatens to undercut Australia's "traditional" predominance in its immediate region. It also comes a month after the government introduced sweeping legislation to crack down on interference by foreign states. Beijing was again at the heart of Canberra's concerns, after a steady drip-feed of revelations about political donations, legal under Australia's lax party funding arrangements, and other activities linked to China's ruling Communist Party. As Australia enters choppier waters in its relations with China, ties with the US are also undergoing significant changes from the Obama years. A year ago, President Trump's testy first phone call with Prime Minister Turnbull famously made headlines around the world. While Washington has since quietly honoured the refugee resettlement deal that so irritated the new President, the lesson for Mr Turnbull was to steer clear of difficult questions with such a thin-skinned counterpart. Plainly, however, it is not business as usual in Washington. If Canberra has avoided direct friction since the phone call, it acutely feels the void of American leadership in Asia, and the undermining of global institutions like the World Trade Organisation. Mr Trump's singular concern with de-fanging a nuclear North Korea, logical from an America-first viewpoint, also risks distracting from China's slower-burning challenge to the "rules-based" order. But there are signs of things to come that bear watching. Despite his lionisation of President Xi Jinping, the broader US-China relationship is becoming increasingly adversarial. This was apparent in the US' new national security strategy and is likely to cast a longer shadow over US-China policy than Mr Trump. While Canberra has no US ambassador, the charismatic head of the US Pacific Command (Pacom), Admiral Harry Harris, has his eyes on the job and would be a useful conduit to Washington. Adm Harris has made no secret of his support for the recently revived Australia-India-Japan-US quadrilateral, and would do his bit to keep the US committed to the Indo-Pacific, as the administration now calls the macro-region. Australia was the first to officially embrace the Indo-Pacific, which reframes Asia's geography in maritime strategic terms. The diplomatic advantage for Canberra is that the Indo-Pacific places it in an unaccustomed central position, while overlapping Pacom's sprawling area of responsibility from the US west coast to the India-Pakistan border. Can the revived quad help a middle power like Australia to maintain peace and order across this vast Indo-Pacific macro-region? The quad's four members fit the Indo-Pacific's compass points, although China is missing. One common criticism, which helps explain why Canberra got cold feet when the quad was first launched 10 years ago, is that it resembles a framework to contain China. But China has long since outgrown containment, if that was ever an option. The quad's humble reincarnation, as a meeting of officials on the margins of last year's East Asia Summit, befits more modest expectations. If China oversteps the mark, pushing its weight around in the Indian Ocean for example, it could develop into a more defence-oriented compact to constrain Beijing's activities. But the four members have different threat perceptions towards China, and are likely to act in concert only if Beijing's behaviour changes for the worse. Another way to think about the quad is as a framework for tethering a more ambivalent and impulsive US into a regional security role. Without the US present in the region, there is little prospect for Australia and like-minded countries to counter-balance China. 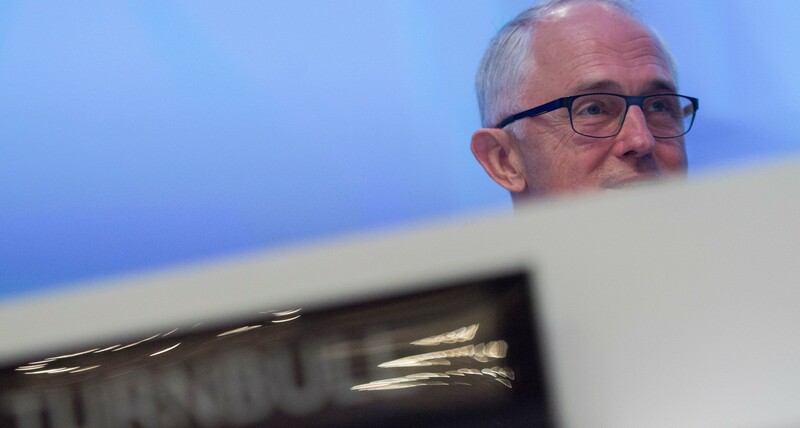 South-east Asians could be forgiven for eyeing the Quad warily, since it bypasses Asean centrality - a point of potential embarrassment for Mr Turnbull as he prepares to host all 10 Asean leaders in Sydney, this March, for a special anniversary summit. Privately, however, some observers will tacitly appreciate the quad's value as an Indo-Pacific strategic safety net, if Asean's efforts to negotiate a South China Sea Code of Conduct (COC) fail to tame China's hegemonic ambitions. There is concern that a weak Asean risks becoming a vortex that plays to China's divide and conquer tactics on the South China Sea. Canberra will therefore be looking to Singapore, chairing Asean this year, to bring some credibility to the COC negotiations. Fundamentally, it follows that if US global leadership is faltering and Washington's strategic attention is narrowly on North-east Asia, then Australia's heft as a security provider will have to count for more, particularly in its nearer regions, South-east Asia and the South Pacific. Australia is stepping up its engagement. In South-east Asia, a new bilateral strategic partnership with Vietnam is expected to be concluded shortly, and defence engagement is likely to develop further this year with the Philippines and via the Five Power Defence Arrangements. Singapore remains Australia's most advanced defence partner in South-east Asia. Canberra's military capacity, though modernising, is still relatively small. As Australia winds down its combat involvement in Iraq and Syria, defence resources will need to be carefully husbanded for security closer to home. Last year's Indo-Pacific Endeavour expeditionary exercise was an impressive demonstration of Australia's regional reach, in partnership with other countries. Bilateral defence cooperation with India and Japan is also likely to progress, though at a cautious pace, probably including a visiting forces agreement with the latter. One thing is certain, going it alone is not an option. Australia needs friends and partners in the region more than ever.